Tamil Nadu and Himachal Pradesh rank high on human development indicators among Indian states. The India Human Development Report 2011, prepared by the Institute of Applied Manpower Research (IAMR), categorized them as “median” states, putting them significantly ahead of the national average. IAMR is an autonomous arm of India's Planning Commission. Himachal Pradesh ranked 4 and Tamil Nadu 11 in literacy rates on India's National Family Health Survey released in 2007. 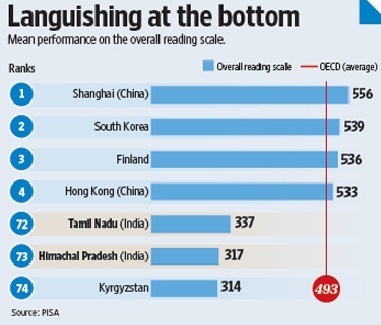 However, in the PISA study, Tamil Nadu ranked 72 and Himachal Pradesh 73, just ahead of the bottom-ranked Kyrgyzstan in mathematics and overall reading skills. Shanghai, China's biggest city, topped the PISA rankings in all three categories—overall reading skills, mathematical and scientific literacy. The new entrants included Costa Rica, Georgia, India (Himachal Pradesh & Tamil Nadu), Malaysia, Malta, Mauritius, Venezuela (Miranda), Moldova, United Arab Emirates. PISA 2009+ involved testing just over 46 000 students across these ten economies, representing a total of about 1,377,000 15-year-olds. In Tamil Nadu, only 17% of students were estimated to possess proficiency in reading that is at or above the baseline needed to be effective and productive in life. In Himachal Pradesh, this level is 11%. “This compares to 81% of students performing at or above the baseline level in reading in the OECD countries, on an average,” said the study. The average Indian child taking part in PISA2009+ is 40 to 50 points behind the worst students in the economic superstars. Even the best performers in Tamil Nadu and Himachal Pradesh - the top 5 percent who India will need in science and technology to complete globally - were almost 100 points behind the average child in Singapore and 83 points behind the average Korean - and a staggering 250 points behind the best in the best. The 2003 TIMSS study ranked India at 46 among 51 countries. Indian students' score was 392 versus average of 467 for the group. These results were contained in a Harvard University report titled "India Shining and Bharat Drowning". These results are not only a wake-up call for the "India Shining" brigade, but also raise serious questions about the credibility of India's western cheerleaders like Indian-American journalist Fareed Zakaria and New York Times' columnist Tom Friedman. AOA. How come Pakistan is not taking part in these international assessments? Haseeb: "How come Pakistan is not taking part in these international assessments?" I don't know why. But I do think it's something Pakistani education establishment should consider. There was an effort in that direction in 2005 when ACER's (Australian Council for Education Research) International Institute worked with Melbourne University to deliver training to a group of 14 senior education administrators from Pakistan. The training took place over three weeks and ACER staff presented a program on monitoring and evaluation in secondary science for the group from the provinces of the Punjab, Balochistan and North West Frontier Province. I like your writings and efforts to bring up good information but this is another example of putting down India. Please tell me what is gained by such derogatory statements and how it helps (1). a more positive image of Pakistan, and (2). the chances of better understanding and peace between the two countries. If I was from India, I would be offended and retaliate with harsh words, just as I would be offended by similar writing to put down Pakistan. Amjad: "I like your writings and efforts to bring up good information but this is another example of putting down India." There's nothing derogatory in my post. It's based on facts with credible sources cited, and my candid opinion as a blogger. I offer similar commentary on the results of dysfunction in Pakistan. There can be no improvement without facing the realities of poverty of education and lack of human development in South Asia. "AOA. How come Pakistan is not taking part in these international assessments?" For what? Only to prove that Pak education is non existent. Ask yourself? How come Pakistan has no name in knowledge based economy unlike India. It is not as if it is below the dignity of Pakistanis to work in IT, medical, back office sectors. Given that their rupee is 50% worse than Indian rupees, it would have been a win-win situation for both Pak and west. Did it ever happen? NOT. Riaz has posted this to annoy Indians who I am sure must be bombarding him with insulting messages. And this is where he is wrong. No one in the west looks for result of such tests before deciding to outsource. No one in west looks at these tests before hiring an Indian. the recent fair act for change in Greencard is directed towards Indians and Chinese so that more of them can get GC. Does that tell something about US govt preferring Indians/Chinese over others. I am happy for this low class education. Riaz: Far from being annoyed, I actually enjoy this because how much you are envious of India's success is visible in this post. If you think this would help Pakistan even .001%, then Insha Allah. Mukund: "For what? Only to prove that Pak education is non existent." It's just pure angry speculation on your part because Pakistani students did not take the test and we don't know for sure how they'd do. Given the similarities between Indian and Pakistani education systems, it's quite probable that Pakistanis would fare as poorly as their Indian counterparts if they took PISA and TIMSS. In any event, knowing what I know I'd say Pakistanis have a lot of work to do to be competitive in terms of the quality of education. 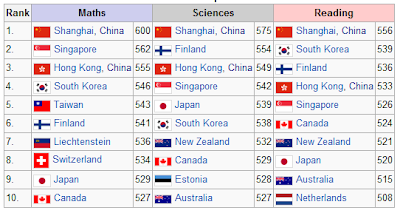 What is clear from the PISA results is that the Chinese students topped the list of 74 nations and Indian students ended up second to last at #73. So the Indians comparing themselves with China and the whole BRIC thing is just ludicrous. The only thing common between India and China is the size of the population. Even the whole BRIC hype about India is fading with Goldman Sachs' Jim O'Neill expressing disappointment with India. One chinese city(not a province) took part. vs two Indian states....not a fair comparison. I would take this as a compliment that Indians are in a position to sell themselves for service in-spite of them not being up to the mark by the so called survey done by Australia. Further in practical terms the west does not want to recruit much or outsource much from a place where it is perceived to be fomenting the Islamic fundamentalism against west. In fact now a days even the gcc is selective in getting people inside the country as they don't want either the virus of democracy or Islamic fundamentalism in the backyard. It does not matter till such time services are sold and there is enough market. Probably Pakistan can look at what it can do to cut in the pie would be more a positive approach. In other words, only a little over one in six students in Tamil Nadu and nearly one in 10 students in Himachal Pradesh are performing at the OECD average. A similar trend was observed in mathematical and scientific literacy, too. on average 1/8*1200=150 million Indians are performing at first world levels. It gets even more interesting @ top 5% here it is at par with Norway and outperforms all other developing countries outside China. "Even the whole BRIC hype about India is fading with Goldman Sachs' Jim O'Neill expressing disappointment with India." Not as fast as the economy of western countries, deep in debt and almost bankrupt. UK, Italy, Spain and even USA. It is amusing how you ignore that and harp on India. Anon: "Not as fast as the economy of western countries, deep in debt and almost bankrupt. UK, Italy, Spain and even USA." Well, the West going down is just more bad news for India, given India's heavy reliance on foreign capital inflows from US and Europe that sustain its economy. Without such capital inflows (FII+FDI+NRI remittances), India could have a serious balance of payments crisis that Jim O'Neill of Goldman Sachs has warned about. Anon: "on average 1/8*1200=150 million Indians are performing at first world levels." 1.2 billion is the population of India, not the number of Indian children attending school. Millions of Indians, particularly in the Hindi belt, are out of school. A recent Indian report compared the quality of primary education in these populous northern states of UP and Bihar with that in Afghanistan and Papua New Guinea. Adult literacy in India is among the lowest in the world. There are 270 million illiterate adults in India, the largest in the world, according to UNESCO. "Well, the West going down is just more bad news for India, given India's heavy reliance on foreign capital inflows from US and Europe that sustain its economy." But that does not answer my question. Why don't you talk about bankrupt US economy and other European countries. Bangalore: The draught of education in India has reached the extreme as it ranks sixth among the seven emerging economies of the world, in terms of education quality. The country has scored only 3.3 points in the study, in terms of primary, secondary, tertiary and demographic parameters, while Russia topped the chart with 7.3 points. As per the Assocham study, India was at the last position in terms of quality of secondary education while Russia and Brazil had maximum scores. The quality of tertiary education in India was lowest among the other emerging nations. The points it scored on the scale of 2, was 0.1. Even though the demographics of India are considered its strength, the country has scored the minimum in this too and was ranked at last place. Moreover, in terms of students enrollment for primary education, India is highly incompetitive with the gross enrollment ratio standing at 98.1. "Serious attention needs to be paid towards the education system. India may stand to loose its competitive advantages against the other countries in long term if corrective measures are not taken to strengthen the Indian education system qualitatively," said Sajjan Jindal, ASSOCHAM President while releasing the ASSOCHAM Eco Pulse (AEP) Study 'Comparative Study of Emerging Economies on Quality of Education'. It was carried out on the basis of 20 parameters relating to primary, secondary, tertiary education and higher education and demography and data provided by UNESCO, IMF, WEF, Financial Times was used for the purpose. Among the rest five countries, China has secured second place with scoring 6.7 points, while Brazil has positioned itself at third place with 5.56 score points as the quality of education in Brazil remains stable across all levels of primary, secondary and higher education. Mexico has been ranked at fourth place on the strength of its higher education. South Africa, a relatively new entrant to the club of developing economies, has managed to be on fifth place on the strength of its tertiary education and demographic qualities though it lags far behind in primary education. However, Indonesia stands at the last position with an overall score of 2.68 points. The gross enrolment ratio is highest in Brazil (148.5), followed by China (116.2) and Russia (113.8). Even Indonesia (110.9) and South Africa (105.1) enjoy better enrolment ratio than India. However, only in terms of teacher-student ratio the country outsmarts all as in India for every forty students, there is one teacher. Mass discovered a significantly different country: more education for young children, an exploding population, and a country not nearly as friendly to the United States as it was when she was there years ago. I wouldn’t call any of these changes a great surprise, yet I found Back to Pakistan totally engaging for the contrasts I have already mentioned—plus the mirroring of some of the experiences I encountered as a volunteer in Nigeria. Shift to 2009. Mass returns to Pakistan with several others, including people who were in the Peace Corps all those years ago. She’s been teaching for decades, earned a doctorate in early and middle school education, and retired from her job as director of an educational program at Ohio Wesleyan University. She’s a pro, accustomed to training teachers, which she and her friends will do in Pakistan for several months. They have been successful with making arrangements with The Citizens Foundation (TCF), a private organization that has set up several hundred schools across the country since the government-sponsored schools are sadly lacking. TCF has had major successes in the country, largely because of its curriculum and the dedication of its teachers who are women only. Mass, thus, in 2009 is part volunteer, part educational expert, part tourist, keenly attuned to all the differences in the country from the first time she worked there. The activities with TCF are totally professional, and instantly rewarding. But it is an incident related to her by Ateed Riaz, one of the organization’s founding directors, that is most revealing to Mass (and to this reader), providing the context for the country’s education and development: “A friend of mine went to the city of Medina and went to a woman squatting on the floor selling something. He negotiated with her, but she would not sell to him. She said, ‘If you like it, buy it from that other tradeswoman. I will not sell it to you.’ So he got a local to come and talk to her in her own language. She talked to the local and explained that she had already sold enough that day and that other woman had not yet sold any, so I should buy from her. The message is clear: We need to help each other." there is no use in making all indian international standard as every country limits the expat. who are not in a position to go to their international standard will be a resource for the local business after it all requires human capital. Atleast in india corporate and people are concern about the education and it is moving slow in the correct direction, but it is not so in case of bangladesh or pakistan. So How can Pakistan help India in Education ? Pakistan has got atleast some responsibility to help their backward neighbours. Malik: "So How can Pakistan help India in Education ?" By helping itself first in overcoming its own education deficits. Perception of Indians in USA is that Indian Americans are smart, yet we have NEVER been shown ANY hard evidence on what is the average IQ of these so called "smart" Indians in America. Evidences such as average IQ, or at least SAT scores with Indians ONLY, not mixed together with other high achieving East Asians under a ridiculous concept of "Asian" category. Perhaps the inconvenient fact is that Indians are not smart, and genetic variations alone amongst 1.2 billion of them have logically made some smart ones who have by and large flocked into North America under H1B. As for India itself, unlike what mainstream liberal media prefer, India is recognized as a failed state in Asia, a pit that no one, not even Indians, want to live in (except some occasional western tree-hugging pop & Hollywood stars such as lady Gaga and Tom Cruise? ) - a pretty strong evidence of what is India's average IQ. "Perception of Indians in USA is that Indian Americans are smart, yet we have NEVER been shown ANY hard evidence on what is the average IQ of these so called "smart" Indians in America. Evidences such as average IQ, or at least SAT scores with Indians ONLY, not mixed together with other high achieving East Asians under a ridiculous concept of "Asian" category." Attempt to collect any such evidences would be deemed as racist. In UK several years ago it was published that second/third generationIndians do much better than their Pakistanis counterpart. What do you think was the reaction of Pakistani Britishers? Having said it, I do agree with it is ridiculous to suggest that Indians are smart based on tiny percentage of IIT going very smart people. And while we are at it, the same can be said about Americans too, based on my personal experience of working here for nearly two decades. Anon: "In UK several years ago it was published that second/third generationIndians do much better than their Pakistanis counterpart." The demographics of British Pakistanis are well understood---about two-thirds are originally rural peasant folks from Mirpur district in Azad Kashmir who were displaced when Mangla dam was built in Pakistan in the 1960s. Most took the cpmpensation money and used it to buy tickets to the UK and settled there. The children of the early Mirpuri migrants from Pakistani Kashmir in the UK have done fairly well given their humble beginnings, but they are certainly not representative of Pakistan's educated urban middle class, many of whom go to the US and other destinations primarily for higher education and then settle there. >>India is recognized as a failed state in Asia, a pit that no one, not even Indians, want to live in (except some occasional western tree-hugging pop & Hollywood stars such as lady Gaga and Tom Cruise? ) - a pretty strong evidence of what is India's average IQ. For the last well known 6,000 years of Indian History, in the last 250 years, we look like we dont have much (everage)IQ. Not comprehensive, just few examples.. Try comparing the IQ of the rest of the world and Indians during the advanced urban civilizations of Mohenjo-daro and Harappa..
India. Then, compare the IQ of Indians and the rest of the world..
Nobody ever heard of any scientist or mathematician in europe before des cartes... Where did all the pre-calculus mathematics came from ? Around mid seventeen hundreads, we made a mistake. A grave mistake. We paid its price. But we are the sons of our fathers. WE WILL REBUILD IT AGAIN TO A LEVEL THAT NOBODY EVEN DARE TO COMPARE ANYTHING AGANIST THE SONS OF THE MIGHTY INDUS, GANGA AND SARASWATHY. As you can see, we have started it. Thats.... I agree, its not perfect. But seems like its kind of OK ! It is curious to see how you getting angry about Indians making false claims about superior IQ, but are quick to point out the same to east asians. For all its worth, China until 1990 had a lower per capita income than Pakistan and in 1960 South Korea PCI was less than Pakistan. Indeed success in life is no direct co-relation with IQ. Do you think every American has higher IQ just because the std of living here is higher. read the following about Phds in USA. Afzal: "You mean like this:-.."
I bet these PISA test results are ringing alarm bells for those in India hoping the reality of poverty of education in India remains hidden from the likes of Intel who may be hoping to find cheap India replacements for expensive American engineers as part of cost arbitrage. But sooner or later Intel and others are going to find out the reality, as the Indian cream of crop like IIT grads get hired and the rest of the work-force from second and third-tier schools turns out to be duds. Some, like GE, are already bringing some manufacturing jobs back to America. Thank you for all of your Blog posts (especially related to education). Prime Minister Yousaf Raza Gilani has presented a cheque of Rs1 million as a token of appreciation to a student from Taxila who had set a world record in the O-level examinations. Zohaib Asad, a student of Beaconhouse, earned 28 As in the University of Cambridge International O-Level Examinations in 2011. He overtook a record of 23 As, also set by a Pakistani student from Islamabad Ibrahim Shahid. Gilani invited Asad to the Prime Minister House on Thursday and lauded him for making Pakistan’s youth proud. He said that Asad’s achievement will inspire other young students to excel in life through sheer hard work. Asad is currently enrolled at McGill University in Montreal, Canada, where he is pursuing an undergraduate degree in economics and international development. Speaking to the prime minister, he said that he was determined to return to Pakistan after completion of his education to serve the country that has given so much in life at an early age. Gilani appreciated Asad’s sense of devotion to the country the country and said that young people like him were Pakistan’s hope for a brighter future. Asad’s family members were also present in the meeting. The Sindh Education Foundation has handed over the management of 1,200 schools across Sindh to entrepreneurs under its private-public partnership programme, Integrated Education Learning Programme (IELP). The SEF asked entrepreneurs to apply for school adoption by submitting proposals and they received a staggering 9,600 applications. Each proposal was strictly assessed. There should be no other primary school within a one-kilometre radius of the new one or already established school as this would affect enrolment. No other secondary school should exist within a two-kilometre radius. At least 40 children should be enrolled in primary schools and 30 in elementary and secondary classes. The programme requires the student-teacher ratio to be at least 1:4. Teachers should be paid a minimum of Rs5,000 while at least Rs2,500 should be paid to the support staff. Drinking water and clean toilets are other prerequisites for the IELP selection. Out of the total applications received, 4,500 were initially shortlisted and 1,500 were finally randomly selected, informed Sadaf Junaid Zuberi, the SEF senior manager. The final contract signing ceremony was held at the SEF headquarters on Monday where the remaining 300 of the 1,500 selected entrepreneurs sealed their school adoption deal in the presence of Senior Minister for Education and Literacy Pir Mazharul Haq. Prof Anita Ghulam Ali, the SEF managing director, welcomed the guests and school entrepreneurs and called for operators to take up this opportunity with full honesty and commitment. “You can change the future of thousands of children,” she said. Lauding the efforts of the SEF, the education minister said that it has been promoting lasting public-private partnerships in the education sector. The government plans to open more schools under this agreement and people who adopt them will be strictly monitored. The programme was launched in 2009 and was designed to give financial and technical support to new and existing private, community and trust-owned schools throughout the province. Three hundred schools were already working successfully. The project directly reaches 450,000 children. Each entrepreneur will get a 350-rupee subsidy per child from the Sindh government via the SEF. They will be responsible for the school’s management, monitoring, enrolment, building capacity, community and parent mobilisation and student assessment. As the project is fully funded IELP students do not pay any fees. SEF will provide textbooks and classroom aides and will also work on teacher training. IELP follows the SEF’s Promoting Private Schooling in Rural Sindh (PPRS) programme. It is different from the PPRS as it involves both primary and secondary schools. SEF director of programmes, operations and research, Aziz Kabani, said the aim was to “establish public-private partnership to increase access to and improve the quality of educational services to children in marginalised areas of the province”. Usama Mahmoud Hawar, a student at a Turkish school in Pakistan, has become the world champion in mathematics in an exam commissioned by the British Council’s Cambridge University, the Anatolia news agency reported on Sunday. Hawar, one of 12 million students from 200 countries to participate in the exam, was a final-year student at Lahore High School for Boys, one of the Turkish schools operating in Pakistan. The math world champion received a great deal of attention from the Pakistani media, which congratulated the successful students, teachers and schools of the exam. Hawar told Anatolia that he owes his success to his school, math teacher and hard work. The school principal, Adem Akgedik, in comments to Anatolia, said the largest factor in Hawar’s success goes to his math teacher, Mehmet Zengin, who would work with his student for many hours after the school day was over. After completing high school, Hawar said he wants to study economics at a university in Turkey. A total of 6,000 Pakistani students are receiving an education from the 22 internationally acclaimed Turkish schools operating in Pakistan. In a recent speech President Obama exaggerated the competitive threat from India and China. He said,"when global firms were asked a few years back where they planned on building new research and development facilities, nearly 80 per cent said either China or India – because those countries are focused on math and science, and they're focused on training and educating their workforce". Based on the recent PISA test results, Obama may be right about threat from China. But India? I don't agree. The average child in HP & TN is right at the level of the worst OECD or American students (only 1.5 or 7.5 points ahead). Contrary to President Obama's oft-expressed concerns about American students ability to compete with their Indian counterparts, the average 15-year-old Indian placed in an American school would be among the weakest students in the classroom. Even the best TN/HP students are 24 points behind the average American 15 year old. "Based on the recent PISA test results, Obama may be right about threat from China. But India? I don't agree." I agree about India with you. I agree about India with you." PK: "How can you compare a survey on one city Shanghai with 80 million combined population of Two large states of India I.E Tamil Nadu and Himachal Pradesh,..."
These are smaller than Shanghai's 5000 students tested for PISA2009. And look at the huge gap...China at top vs India at bottom among 74 nations tested by PISA2009. Shahid: "Please check the results of the past International Maths Olympiad or the physics Olympiad and see where your counrty stands." Young Pakistani scholars brought laurels to the country by achieving top honours in International Olympiads of Biology, Physics, Chemistry and Mathematics held in different parts of the world. All four members of the Pakistani team won bronze medals in International Biology Olympiad held in Taiwan from July 10-17, 2011. Two students won bronze medals and two honourable mentions in International Physics Olympiad hosted by Thailand from July 10-18, 2011. Two of the four Pakistani teams won bronze medals while one of them clinched honourable mention in International Chemistry Olympiad held in Turkey from July 10-18, 2011. In the International Mathematics Olympiad held from July 16-24, 2011 in the Netherlands, one student won bronze medal and one honourable mention. There are two stereotypes about schooling in east Asia: the students work extremely hard, and the learning is by rote. In fact, things are more complicated, as the OECD’s latest global schools survey has shown. Shanghai came top in the Pisa survey, with three other east Asian territories in the first five. But not all east Asian countries did well, says the OECD’s Andreas Schleicher, adding that it’s innovative thought that is assessed. Shanghai schools aren’t turning children into walking textbooks: they are channelling their ability and enthusaism into exceptional results. How? So why did Shanghai do so well? The OECD points to Chinese school reforms: it was impressed by the initiative shown by teachers, who are now better paid, better trained and keen to mould their own curricula. Poor teachers are speedily replaced. China has also expanded school access, and moved away from learning by rote. The last point is key: Russia performs well in rote-based assessments, but not in Pisa, says Schleicher, head of the indicators and analysis division at the OECD’s directorate for education. China does well in both rote-based and broader assessments. The OECD also points to cultural factors – widespread expectations of high performance, and pressure from parents. And it’s the interaction between culture and the system that is hard to untangle, says Schleicher. If schools did well just because of hard work, then countries with similar cultures should see similar results. 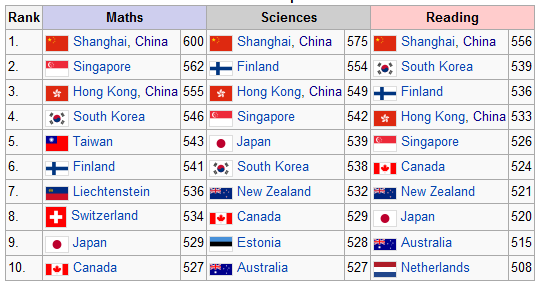 But Finland beats Sweden by a distance, Shanghai beats Taiwan, and Hong Kong beats Macau. Equally, if the schools themselves were uniquely important, then why do young Chinese immigrants do so well in UK classrooms? Culture and system almost certainly reinforce each other: with a merit-based system stimulating hard work, and vice-versa. What can the Pisa survey – recognised as authoritative by many education policymakers – say about universities and employment? Schleicher tells beyondbrics that, according to medium-term data from Canada, students who do well on the Pisa survey are very likely to do well in higher education and the job market. However, that correlation would not necessarily be repeated in China. For one thing, parental pressure eases once students get to universities. For another, Chinese universities have been accused of corruption in how they award degrees – which may undermine the incentives for hard work. There are other unanswered questions. Is Shanghai the exception or the rule in Chinese school standards? In some countries, major cities underperform the national average, but that seems less likely in China, given the coast-interior disparities. However, the OECD did look at some rural areas, and found they matched Shanghai’s quality. Just a few weeks ago, global credit rating agency Standard and Poor’s (S&P) released a study titled, “Will India be the first BRIC fallen angel?” The report suggests that India may become the first “BRIC” country (Brazil, Russia, India and China) to lose its investment grade rating. While it remains to be seen if India can escape this ignominy, the country has earned another dubious distinction: It ranks the lowest among the BRIC nations on the Global Innovation Index 2012. This innovation index was released recently by the international business school INSEAD and the World Intellectual Property Organization (WIPO) along with the Confederation of Indian Industries (CII), Alcatel-Lucent and Booz & Co. The index ranks 141 countries on the basis of their innovation capabilities and results. Brazil, Russia and China were ranked 58th, 51st and 34th respectively. India stands at the 64th position, two notches below where the country landed last year. According to the study, “The innovation front in India continues to be penalized by deficits in human capital and research; infrastructure and business sophistication, where it comes last among BRICs, and in knowledge and technology outputs, where it comes in ahead of Brazil only.” The report also notes that the BRIC countries need to invest further in their innovation capabilities to live up to their expected potential. What has caught the media’s attention is “China’s” surprise topping of this ranking. Here, the NYT reports, “Top Test Scores From Shanghai Stun Educators.” Though I won’t call the NYT article ‘propaganda’, since the content of the article seems balanced, but readers must absolutely bear in mind that the “China” results are only from a highly advanced city. Whereas the U.S. results are country-wide. If PISA had taken a report from just a certain town in Massachusetts or from one of the top cities across America, I guarantee you the U.S. ranking would be in the first place or near the first place. Is the U.S. media turning this PISA 2009 report into a “China threat” and using it as an excuse to try to improve the education system in the United States? Keep this question in mind as you read articles related to this report. After an earlier, embarrassing show, India has backed out of this year's Programme for International Student Assessment (PISA), a global evaluation process by the Organization for Economic Co-operation and Development (OECD) Secretariat that gauges where schoolchildren stand alongside their peers from other countries. This academic Olympics measures the performance of 15-year-olds in their reading, math and science abilities. ... In the last assessment, Tamil Nadu and Himachal Pradesh, showpieces of India's education and development, were put through the PISA evaluation and they performed miserably. The idea was that the entire country would participate in the next round of assessment. However, that plan was also dropped. Just why did Indians perform so badly at the Programme for International Student Assessment (PISA) as to stand at the bottom of the ladder? The government thinks it is not a reflection on the country’s schooling. Advised by the NCERT, the HRD Ministry has concluded that India trailed in the international rankings because of the questions posed. Terming these out of context, the government will take up the issue with organisers of PISA before deciding on full-scale participation in the test for 2012, with students from 10 of its states. Incidentally, PISA results were reaffirmed by NGO Pratham’s annual ASER report on learning levels of schoolchildren. The NCERT in its report concluded that “non-exposure of students (especially in rural areas) towards the items tested in PISA” was a critical factor in the poor performance by Indian students. They cited questions relating to ATMs and use of air bags in cars. Five out of 10 school students of class V in rural India cannot solve simple arithmetic problems, says a nationwide survey on education. Putting a question mark on the quality of education imparted, the findings of the Annual Status of Education Report (ASAR) said while in 2010 more than half of class V students were able to read class II level texts, the proportion came down to 46.8 per cent in 2012. "The decline in reading levels is more visible among children in government schools as compared to those in private schools... It has fallen from 50.7 per cent in 2010 to 41.7 per cent in 2010," the report prepared by Pratham, a voluntary organisation, said. HRD Minister M M Pallam, who released the report, expressed his "dismay" over some of the findings even as he dismissed suggestion that the decline was due to introduction of contentious and comprehensive evaluation (CCE) process in classrooms. "... I will certainly not attribute it to the factor of CCE," he said after president of Pratham Education Foundation Madhav Chavan sought to highlight CCE for some of the negative indicators. Raju also appeared to play down the findings of the report, saying it is a "dipstick survey". He said the ministry has its own NCERT survey conducted every three years though he acknowledged that the survey underscores that "it is important we all work together". The report was based on a survey carried out in rural schools across 567 districts and covering about six lakh children in the age of 3-16. Highlighting the declining reading level, the report said that while seven out of 10 children (70.9 per cent) in class 5 were able to solve simple two-digit subtraction problem, it declined to five out of 10 (53.5 per cent) in 2012. It is now almost four years since I first walked through a series of winding by-lanes in a Mumbai slum toward my new job as a teacher at a low-income school. I was forced to confront India’s educational inequities squarely in the eye. Students filed into a dilapidated old school building, and my own musty classroom, crammed with cupboards, barely left any room to move. What was more jarring than my physical surroundings, however, was the magnitude of my students’ achievement gap. Only a handful of my third-grade students could read first-grade books, and almost all struggled with elementary arithmetic. Despite this being an English-language school, few teachers – and fewer students – could speak the language at all. Indeed, most of my students were unable to recognize basic alphabets or perform simple addition. This was compounded by the sobering fact that families in my slum scrounged to send their kids – boys and girls – to the very best schools they could afford. Why? Because they recognized that education was their only weapon against penury and struggle. They dreamed of their children going on to build livelihoods in a burgeoning economy and pulling them out of the slums. Rubina, a fourth grade student at the Umedbhai Patel School in Mumbai, Maharashtra, in this Aug., 2010 photo.Courtesy of Rakesh Mani Rubina, a fourth grade student at the Umedbhai Patel School in Mumbai, Maharashtra, in this Aug., 2010 photo. Unfortunately, the poor quality of instruction (and high levels of teacher absenteeism) across the proliferation of shoddy schools ensures that they will hardly be able to compete – whether for university admissions or for jobs – with students who can afford expensive, high-quality schooling. Moreover, according to the National Family Health Survey, India now has the highest rate of child malnourishment on the planet – almost twice that of sub-Saharan Africa. The situation across the rest of the country is not much different – according to recent figures, 4 percent of Indian children never start school, 57 percent don’t complete primary school and almost 90 percent — around 172 million — will not complete secondary school. These numbers should deeply anger Indians and force them to question society’s priorities and values. In just a few more decades, the implications of India’s apathy will have profound implications – not just within the country, but around the world as well. “The Indian education system is lost in the past and failing India.” Everyone at the table nods, mumbles their concurrence, and cites the most recent Economist article or Pricewaterhouse Cooper study on the matter in order to masquerade as informed. Yet amongst my fellow Indian education alumni, I mostly hear a deafening silence when it comes to action. What is remarkable is that all students in India know what I am talking about. They know and are coping: Indian students are taking their useless Indian liberal arts degrees and going abroad to get real ones that signify a real education. A real education being one that challenges the intellect and questions paradigms, not one of rote memorisation and conformity. Or, as was the case with my Indian friends at Brown, they skip India altogether. Sure, I took some unimpressive classes at Brown and no curriculum is perfect, but Indian students should be demanding more. Much more. Who, may I ask, do you hope to be your rescuers? Your representatives in government? Your parents? The characters from Rang De Basanti? One lesson that no college is very good at teaching is that in life you should not expect others to fight your battles for you. While higher education is a public good and has champions in the private and public world, students are the ultimate stakeholders. 03/12/2013 - Asian countries outperform the rest of the world in the OECD’s latest PISA survey, which evaluates the knowledge and skills of the world’s 15-year-olds. The OECD’s PISA 2012 tested more than 510,000 students in 65 countries and economies on maths, reading and science. The main focus was on maths. Math proficiency is a strong predictor of positive outcomes for young adults. It influences their ability to participate in post-secondary education and their expected future earnings. Shanghai-China, and Singapore were top in maths, with students in Shanghai scoring the equivalent of nearly three years of schooling above most OECD countries. Hong Kong-China, Chinese Taipei, Korea, Macao-China, Japan, Liechtenstein, Switzerland and the Netherlands were also in the group of top-performing countries. Children whose parents have high expectations perform better: they tend to try harder, have more confidence in their own ability and are more motivated to learn. Of those 64 countries with trend data in maths up to 2012, 25 improved in maths, 25 showed no change and 14 did worse. Brazil, Germany, Israel, Italy, Mexico, Poland, Portugal, Tunisia and Turkey have shown a consistent improvement over this period. Shanghai-China and Singapore improved on their already strong performance in 2009. Italy, Poland and Portugal also increased their share of top performers and reduced their share of low performers. Germany, Mexico and Turkey also managed to improve the performance of their weakest students, many of whom came from socio-economically disadvantaged backgrounds. This shows that countries can simultaneously improve equity and raise performance. - Page 6 defines globalization as: When world is improving its economic condition has effected the world that is called world economy. - The book mentions that the Triple Alliance was between England, France and Russia and the Triple Entente between Germany, Italy and Austria. It was actually the exact opposite. - On page 7, the book mentions that the Kanagawa Treaty was signed between Japanese Prime Minister Tokugawa Shogun and America. Tokugawa Shogun was what the military government was called. A section on the Importance of Computer on Page 63 reads: Computer has become a super friend not only of Indians but of the whole human race. It is so familiar as though one of the indispensable family members of our family. It is equally important to get acquainted and introduced with such an important friend... Where there is computer there is work and where there is work there is career is becoming the motto. Such has grown the importance of the computer in human life as though the man will have to survive on the oxygen of the computer in future. It is becoming the life saving breath to us. Its inevitability has grown through its need and its ultra importance through its inevitability. The newly released Std III Geography textbook has also drawn flak from teachers. The Mumbai Geography Teachers Association (MGTA) has pointed out that a map on page 55 shows Backbay printed in place of Colaba while the Vasai and Malad creeks have been marked on land. Also, the map shows something called the Worli river, which does not exist. The MGTA has written to Balbharti about these errors. mastery of mathematics, reading, and language as defined by national governments. taught in grade 2, tends to be achieved only by grade 4 or 5 (ASER-India 2011). number. By grade 8, only 72 percent could perform simple division. example, only 50 percent of grade 3 students in Punjab, Pakistan, have a complete grasp of grade 1 mathematics (Andrabi et al. 2007). In India, on a test of reading comprehension administered to grade 5 students across the country, only 46 percent were able to correctly identify the cause of an event, and only a third of the students could compute the difference between two decimal numbers (NCERT 2011). Another recent study found that about 43 percent of grade 8 students could not solve a simple division problem. Even recognition of two-digit numbers, supposed to be taught in grade 2, is often not achieved until grade 4 or 5 (Pratham 2011). In Bangladesh, only 25 percent of fifth-grade students have mastered Bangla and 33 percent have mastered the mathematics competencies specified in the national curriculum (World Bank 2013). In the current environment, there is little evidence that learning outcomes will improve by simply increasing school inputs in a business-as-usual manner (Muralidharan and Zieleniak 2012). suggests, arithmetic competency is very low in absolute terms (figure 2.1). Buried inside the bad news is a glimmer of what could be considered hope for Pakistan's grade 5 and 8 students outperforming their counterparts in India. While 72% of Pakistan's 8th graders can do simple division, the comparable figure for Indian 8th graders is just 57%. Among 5th graders, 63% of Pakistanis and 73% of Indians CAN NOT divide a 3 digit number by a single digit number, according to the World Bank report titled "Student Learning in South Asia: Challenges, Opportunities, and Policy Priorities". Unfortunately, although more children are in school, the region still has a major learning challenge in that the children are not acquiring basic skills. For example, only 50 percent of grade 3 students in Punjab, Pakistan, have a complete grasp of grade 1 mathematics (Andrabi et al. 2007). In India, on a test of reading comprehension administered to grade 5 students across the country, only 46 percent were able to correctly identify the cause of an event, and only a third of the students could compute the difference between two decimal numbers (NCERT 2011). Another recent study found that about 43 percent of grade 8 students could not solve a simple division problem. Even recognition of two-digit numbers, supposed to be taught in grade 2, is often not achieved until grade 4 or 5 (Pratham 2011). In Bangladesh, only 25 percent of fifth-grade students have mastered Bangla and 33 percent have mastered the mathematics competencies specified in the national curriculum (World Bank 2013). In the current environment, there is little evidence that learning outcomes will improve by simply increasing school inputs in a business-as-usual manner (Muralidharan and Zieleniak 2012). In rural Pakistan, the Annual State of Education Report (ASER) 2011 assessment suggests, arithmetic competency is very low in absolute terms. For instance, only 37 percent of grade 5 students can divide three-digit numbers by a single-digit number (and only 27 percent in India); and 28 percent of grade 8 students cannot perform simple division. Unlike in rural India, however, in rural Pakistan recognition of two-digit numbers is widespread by grade 3 (SAFED 2012). The Learning and Educational Achievement in Punjab Schools (LEAPS) survey—a 2003 assessment of 12,000 children in grade 3 in the province—also found that children were performing significantly below curricular standards (Andrabi et al. 2007). Most could not answer simple math questions, and many children finished grade 3 unable to perform mathematical operations covered in the grade 1 curriculum. A 2009 assessment of 40,000 grade 4 students in the province of Sindh similarly found that while 74 percent of students could add two numbers, only 49 percent could subtract two numbers (PEACE 2010). Cheating in school tests is an old Indian problem. But the malpractice literally scaled new heights this week in the eastern state of Bihar when relatives of 10th-grade students climbed the wall of a school building and perched precariously from windows of classrooms as they handed cheat sheets to children writing the tests inside. Photographs and videos showing parents, friends and others scaling the school wall — Spiderman-style — went viral in India on Thursday. Police officers standing nearby watched helplessly. Cheating is common in schools in remote rural areas in India, where jobs and seats in college courses are few but competition is fierce. But the sight of parents risking their life and limbs to climb the walls shocked many Indians. Under Bihar’s anti-cheating law, dozens of 12th-grade students were expelled and their parents detained last month in cases of cheating in tests. Many students in India drop out of school because they fail to pass the tough standardized tests in their 10th and 12th grades. Education experts say that cheating is just a symptom of the deeper problems that plague India's education system, such as teacher absenteeism, emphasis on rote learning and inadequate school infrastructure. A recent study by the Pratham Education Foundation showed that only 48 percent of fifth-grade students could read a second-grade textbook. Authorities expelled nearly 500 students from the tests, according to local media reports. When compared to student performance in India, a country with similar per capita GDP, 47% of grade 5 pupils were unable to subtract even two-digit numbers. Please credit and share this article with others using this link:http://www.bangkokpost.com/opinion/opinion/753840/vietnam-high-pisa-scores-cause-a-stir. View our policies at http://goo.gl/9HgTd and http://goo.gl/ou6Ip. © Post Publishing PCL. All rights reserved. Indians: 577, USA: 533, china: 581. Despite having the lowest PISA scores, Indians have among the highest GMAT scores which means that education received after PISA (15 year of age) puts them much above average white. Lastly, if you look at the sample size of GMAT, GRE and SAT; it covers 160,000 people per year. And estimated to cover 25% of Indian population. Indian+Pakistani IQ is 107.25. Indian American IQ being 112. Salaries follow the verbal IQs (Indians followed by chinese followed by Malays). Indian Singaporean IQ:- 110 verbal IQ, 100 non-verbal IQ. Chinese Singaporean IQ:- 103.5 verbal, 112 non-verbal. Malay Singaporean:- 97 verbal, 94 non-verbal. Based on school results in Singapore by race. Done on 100% population as everyone goes to school in SGP. So, we not only beat the white Americans in USA. But also Singaporean Chinese on incomes. Indians: 72.9, chinese: 74 pc, Whites: 56 pc. Page 8. Indians and Chinese scoring 108 IQ on UK GCSE results. Nationwide sample.